Fighting fire with fire doesn’t work in human conflicts—but it’s how forest fires are fought. 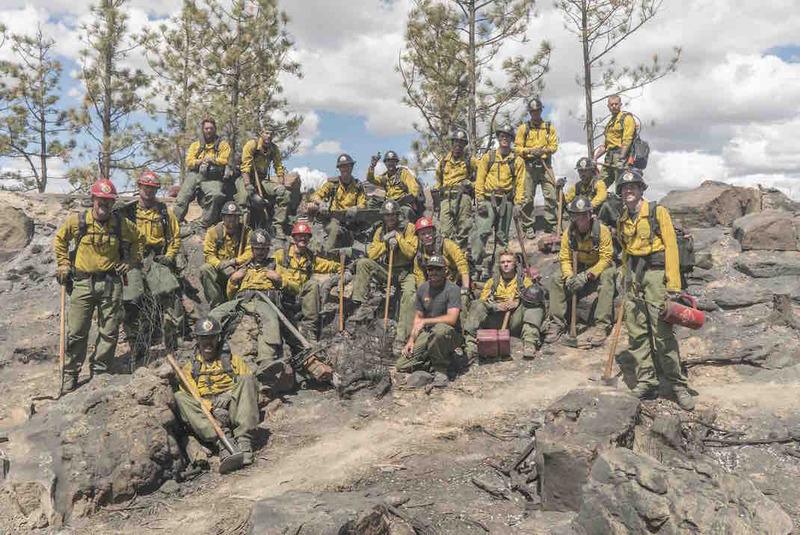 Crack teams, known as hotshots, anticipate the path of the rolling fire, then clear a large swath, chopping trees, chain-sawing, trench-digging, and pre-burning underbrush and exposed roots. When the massive conflagration arrives, it’s stymied; it can’t jump that big of a gap. Thus, fire is fought with fire. Imagine the mental toughness, strength, and endurance it takes to clear a big enough space, all while a 2,000-degree, 70-foot-flame-throwing monster is bearing down on you. And speaking of bearing, imagine a flaming grizzly bear, exploding out of that wall of flame in a death gallop. Smokey the Bear, indeed. 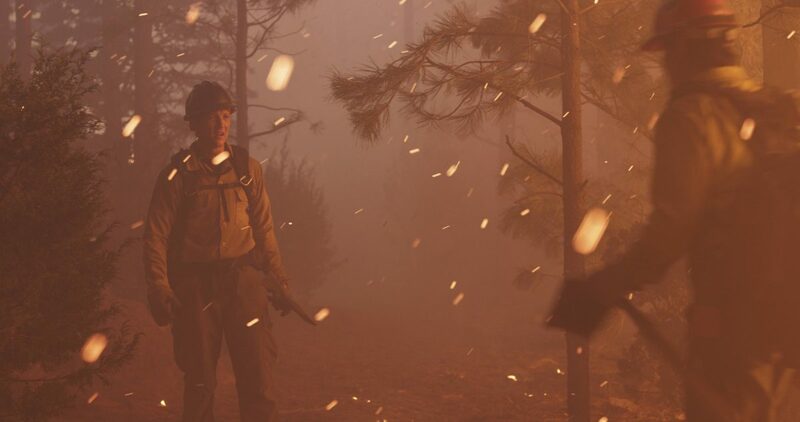 The burning bear is a recurring nightmare image in “Only the Brave;” one that haunts Eric “Supe” Marsh (Josh Brolin), the supervisor of the titular team. 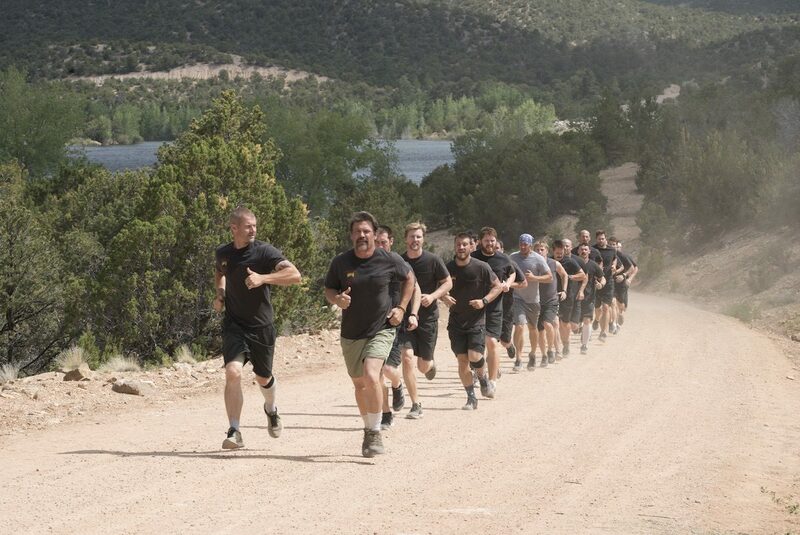 “Only the Brave” is the forest-fire equivalent of its urban cousin, 1991’s “Backdraft.” Both are intensely gripping, and both are filled with manly men doing manly, testosterone-filled things, along with the hazing and bonding so necessary to keep order in an exclusively alpha-male group. The only difference is, this story is based on true events. It’s also educational. Americans may be familiar with the term “hotshots,” but the film is full of “Aha! So that’s how they do that!” moments, like the image of a gigantic helicopter dropping an elephant trunk-like hose into someone’s swimming pool and hosing a blaze with it. 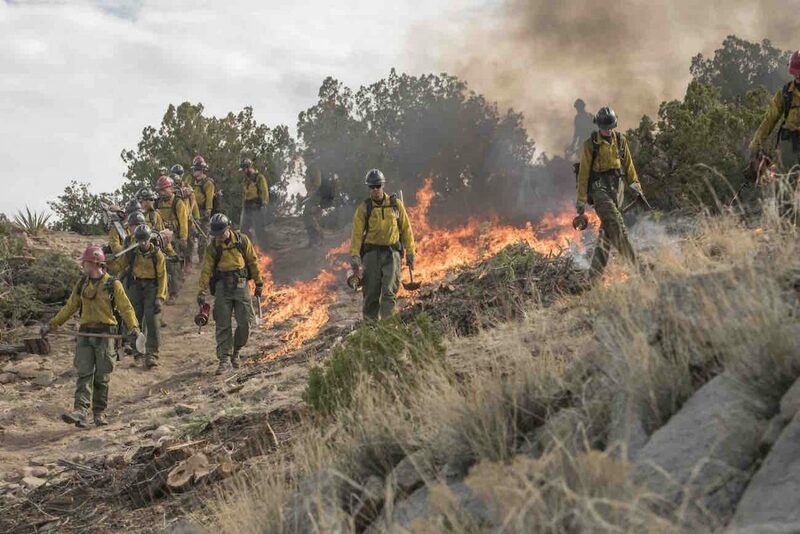 1) The Prescott, Arizona, Group 7 deuce fire crew (who are “Type 2’s,” or “deuces,” the local, low-on-the-totem-pole guys who clean up after the elite hotshot teams who jet around the country, following the big fires) and their bid to attain the coveted national hotshot status. 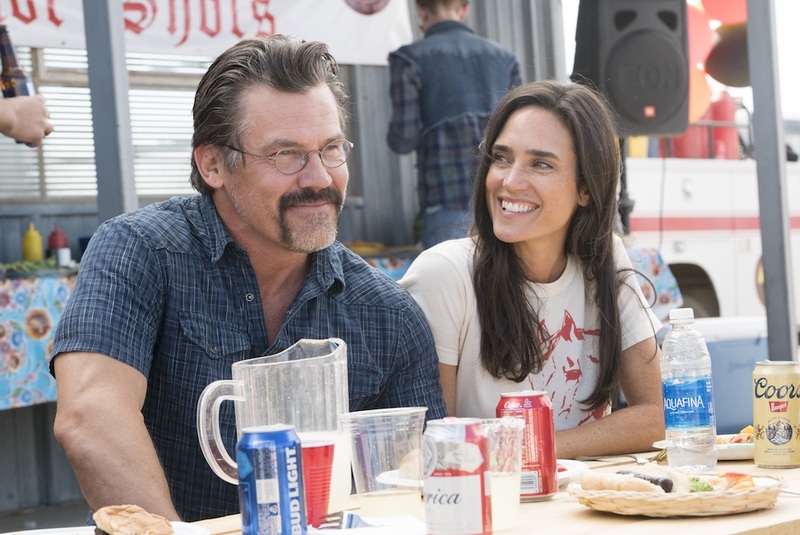 2) Supe and his spunky horse trainer wife, Amanda (Jennifer Connelly)—she wants a baby; he, not so much. They’re at the stage in marriage where the old adage is beginning to rear its ugly head—women enter marriage thinking they can change their men (and men don’t change), and men enter marriage thinking their women will stay the same (and women change). 3) Supe and his new trainee, Brendan “Doughnut” McDonough (Miles Teller), a dyed-blond drug-user/loser trying his best to go straight, due to feeling a powerful responsibility in the face of unexpected fatherhood. 4) All-male bonding and hazing and pranking, all the time. Arizona’s Granite Mountain Hotshots were the only local team of deuces to ever nail the hotshot upgrade—a heroic accomplishment in itself—and went on to become larger-than-life tragic heroes, saving a whole town in the 2013 Yarnell wildfire, the most devastating day for American firefighters since 9/11. The fact that Josh Brolin was an actual Arizona volunteer firefighter in his pre-movie star days made for fortuitous casting, along with the fact that manly macho men are his bread and butter. The fact that Supe and his wife met (one can infer) in a 12-step meeting is lent credence by Connelly, whose movie characters tend to know a thing or two about suffering due to drug use. 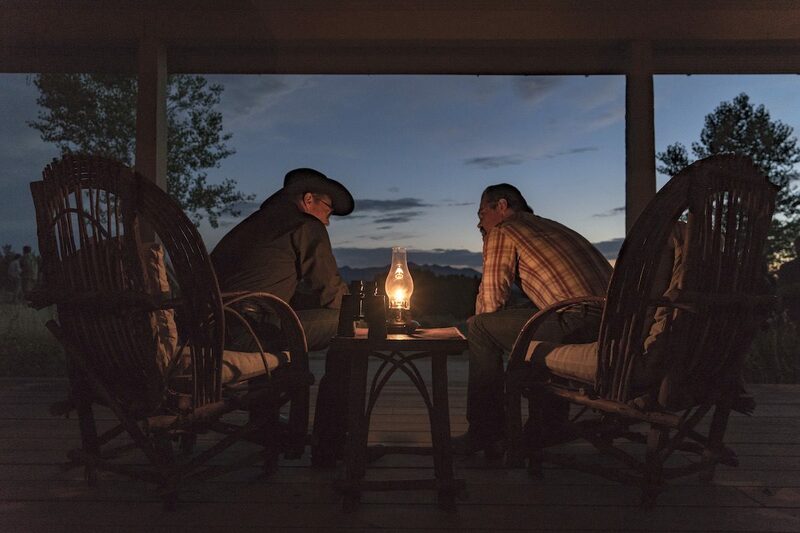 The fact that Jeff Bridges has adopted and perfected the same Western-situated, drawling, twang-y, paunchy, jowly characterization for what feels like his last 15 films, makes his character here feel like it’s a brand unto itself, which automatically lends authenticity to any countrified situation into which it’s inserted—in this case, playing Prescott, Arizona’s wildland division chief, who often mentors Supe Marsh. And the fact that character-actor-in-a-leading-man’s-body Miles Teller is on a smoking-hot, actor-of-the-moment roll brings home the story’s tragedy. 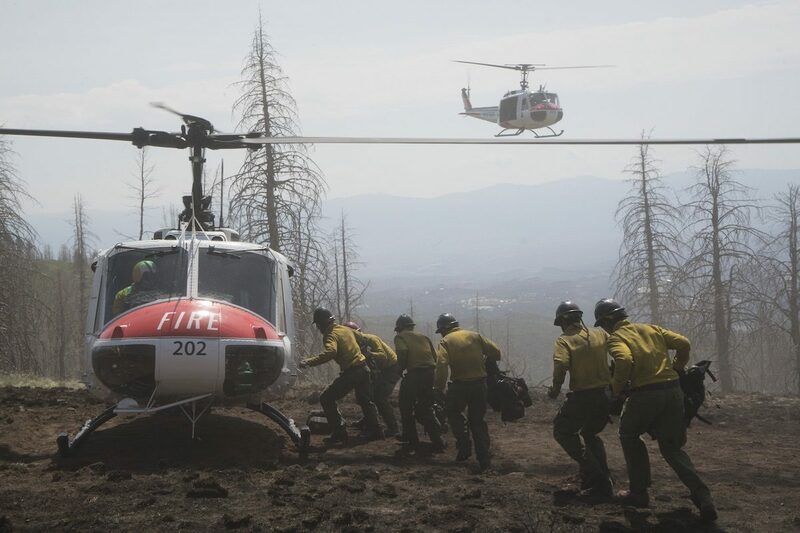 Like a war movie, there’s lots of training and practicing and deploying stuff for the survival of big blazes, along with the (literally here) forged-in-flames friendships. What do forest firefighters do if they happen to get overrun by those giant, orange, rolling terrors? They’re timed on how quickly they can deploy what look like body-sized shower caps (fire retardant, in this case) and slam face-down in the dirt (scrunchy side down). Human lungs can take only one or two breaths of 300-degree air. The 2,000-degree, granite-cracking heat of a mammoth forest fire can sometimes race overhead so fast that human survival is a possibility. Sometimes. While it could be argued that hotshots only visit violence upon shrubbery, it’s arguably among the most heroic of all human professions.